We know we are late to the cherpumple game, but we're enamored with this monstrosity and we have to talk about it. If you thought the cookie cake pie was intense -- remember this crazy pie that's filled with cake batter and cookie dough -- you haven't seen anything yet. The cherpumple puts that over-the-top dessert trifecta to shame. It's child's play in comparison. 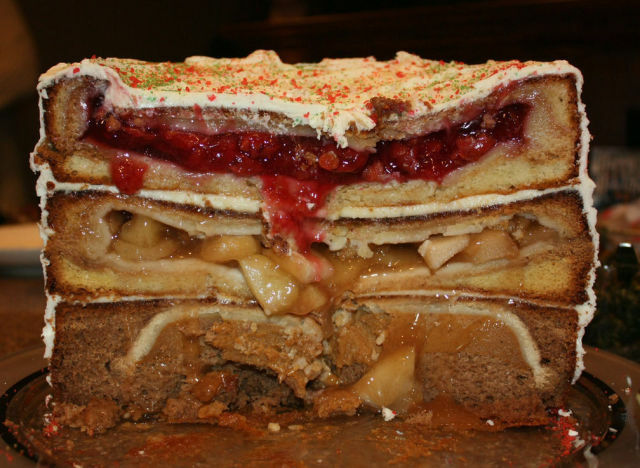 The cherpumple takes three kinds of pies (the combination of which makes up its name), bakes them into three kinds of cakes, stacks one on top of the other, frosts it all together and serves it as one single dessert. Take a moment and look at the photo below to let it really soak in. This was the original cherpumple. What you're looking at is a cherry pie baked into a white cake on top of an apple pie baked into a yellow cake on top of and a pumpkin pie baked into a spiced cake that has all been frosted together. It's awesome and absolutely offensive all in one. 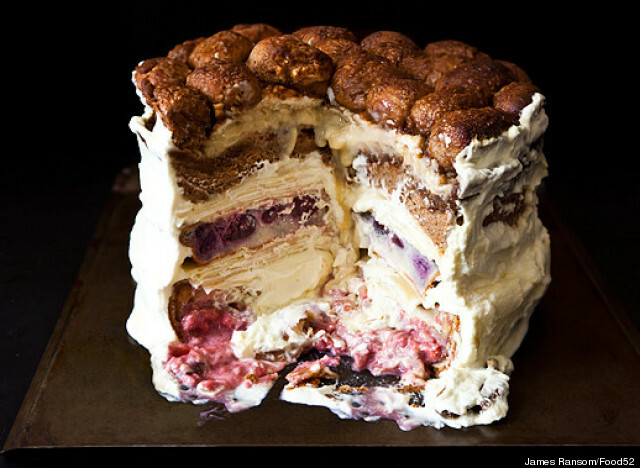 We have Humorist Charles Phoenix to thank (or curse) for the creation of this dessert. The cherpumple was his sugar-filled response to the Thanksgiving turducken. While this dessert clearly has Thanksgiving written all over it, we think with summer pies coming into season people might want to experiment with a new version. Our friends at Food52 did; they came up with a summery version of Phoenix's cherpumple which they labeled the Clananafouti Swamp Monkey. Their rendition was made up of banana meringue pie baked in Monkey Bread, a cherry clafouti baked inside a Milles Crepes cake and a raspberry pie embedded into a classic yellow cake. Their version was ambitios to say the least. And while it had technical problems, it is 100 percent inspiring (and totally insane). Take a look at this thing. What do you think of the cherpumple: awesome or terrifying? Would you bake one? Let us know in the comments below. Follow HuffPost Taste's board Pies & Sweet Tarts on Pinterest.